W HEN IT COMES TO HOCKEY in Marquette, Mich., Doug Garrow has seen it all. As a kid, he played hockey in this small town nestled in the Upper Peninsula. He played col- legiately at Northern Michigan University and is now a coach back in his hometown. B e c a u s e G a r r o w h a s s p e n t h i s l i f e i n Marquette and enjoys the sport, he's wit- nessed the entire life of Lakeview Arena. He was around when it opened in 1974 and has since seen it slowly wear down. W i t h t h e a r e n a 's b e s t d a y s b e h i n d i t , Garrow and others knew something had to be done. 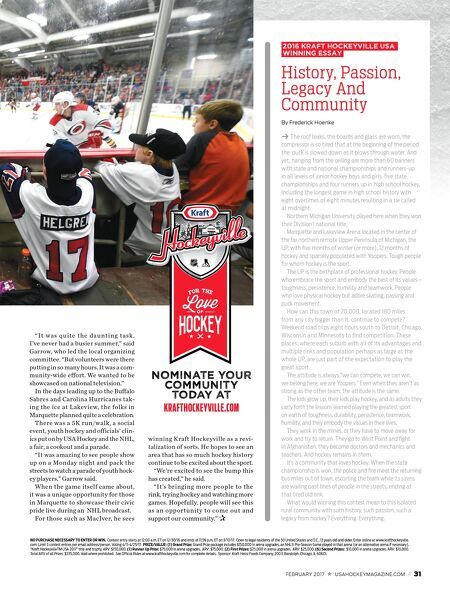 This need led to the community working together to be named this year 's recipient of Kraft Hockeyville USA™. Now, this community with a long hockey history has an even brighter future. Hockey has been a part of the U.P. since the early 20th century. In Marquette, community members routinely flock to the local rink. For the early part of the century, it was called the Palestra. Now, it's Lakeview. The rink regularly draws a large number of visitors, whether it's players, coaches, fans or those who love hockey and need something to do during the long U.P. winters. W h i l e h o c k e y c o n t i n u e s t o t h r i v e i n Marquette, Lakeview was in need of some help. The ice plant, glass and other key parts of the rink were in dire need of repair. Unfortunately, the money wasn't available. That led Andrew MacIver, coordinator of the Parks and Recreation department for the city of Marquette, to look for outside help to improve the rink. It was suggested that someone in town should nominate Lakeview for the 2016 Kraft Hockeyville contest. One parent who stepped up was Dr. Fredrick Hoenke. His children have played hockey in Marquette and spent many hours at Lakeview. Hoenke's nomination essay talked about the declining state of the rink and its impor- tance to the community. While he didn't know much about the con- test when he submitted his entry, Hoenke would soon become a major player in the town's efforts. His letter earned Lakeview a spot in the top 10. "We touched a nerve with the essay," Hoenke said. "We got a real avalanche of people inter- ested in us up here in the Upper Peninsula and our rink. It was remarkable." After making it to the final vote, Marquette was announced as the winner on NBC Sports Network on April 30. It was a moment that won't be forgotten any time soon. "I was almost shedding tears of joy," Garrow said. "A lot of people put a lot of time into this. It's just such a great thing for the area. You can't put a price tag on being showcased nationally like this." From the moment it was announced that Marquette was 2016's Kraft Hockeyville USA™ and would host an NHL preseason game in October, the race was on to get Lakeview Arena ready for its primetime revival. During the weeks and months leading up to the game, volunteers and workers logged hundreds of hours to prepare the rink for the bright lights of national television and the NHL. 30 // FEBRUARY 2017 USAHOCKEYMAGAZINE.COM By Ryan Williamson Michigan's Upper Peninsula Town Of Marquette Crowned Kraft Hockeyville USA ™ I was almost shedding tears of joy. It's just such a great thing for the area." U.P. And Away Through Kraft Hockeyville, young players and fans got an up-close look at what hockey played at its highest level looks like.